Wagyu cattle are a genetically unique breed. The marbling occurs in the muscle (intra muscular fat) of the animal rather than on the perimeter of the muscle (subcutaneous fat). When it is a 50/50 cross between a Wagyu and an Angus, the Wagyu contributes its intense marbling and the Angus contributes to size and growth. A 75% of Wagyu genetics will even further improve the marbling and taste of the meat. Wagyu cattle attains its intense marbling relatively late in life – month 28 – 36. Traditional cattle are typically slaughtered at 12 – 18 months. The weight gain should be less than the normal 1.7 kg/day to 2.0/day in a feedlot. There are as many methods to grain finishing cattle as there are farmers. The Wagyu uses a longer, slower feeding and growth method. When all is said and done, the answer is up to you. Grass fed or Grain fed. The choice is yours. Nice to have a choice, isn’t it! The site of digestion of the maize may play a role in marbling. Grain that bypasses rumen fermentation is digested and absorbed in the small intestinal tract of the cattle. The starch absorbed from the intestine is thought to increase marbling content more efficiently. The starch in freshly harvested maize digests mainly in the rumen. As maize matures over time (>4 months post harvesting) more starch digests in the small intestine. This “maturing” process in maize and maize silage improves up to 12 months of age. The starch in hominy chop is fine and will digest mainly in the rumen and is therefore not recommend. Grain processing (grinding, steam flaking and the fine starch in chop) can also impact marbling negatively as this type of starch digests mainly in the rumen. Whole maize has less available rumen starch. More starch bypasses the rumen and is digested and absorbed in the small intestine. At Kansas State University research showed that when the amount of distiller’s grains (12% fat) was increased in the diet the result was reduced marbling. The fat % in hominy chop is 9.0% more or less and 3.0% in maize, therefore maize will result in an improved marbling of the muscle. A lower daily fat intake improved the marbling in the meat positively. Dietary protein level may also impact marbling. An increase in the protein content of the diet may increase starch digestion and absorption in the small intestine. Increase the dry matter protein to 16% on a DM basis in young calves after weaning until the weight is at least 300 kg. It can then be reduced to 14% protein on a DM basis. The combination of higher protein and starch / grain in diets together with 40% of hay or veld grass will lead to more marbling. 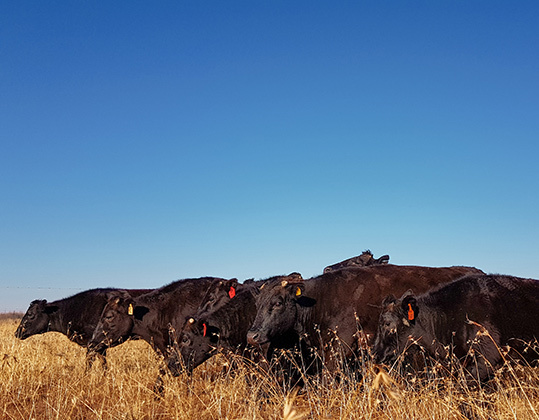 The more consistently you can manage your cattle by minimising stress and by standardising your approach to nutrition and management, the more likely the Wagyu industry in South Africa will be successful. Consistency of management and nutrition affects the consistency of the final product. protein and 11.5 MJ/kg on a DM basis) calves should be fed a high energy / maize diet before and after weaning. Research has not yet precisely determined the minimum ADG below which marbling is at risk or being lowered. A US study showed that calves treated two or more times for bovine respiratory disease (BRD) in the feedlot had a 33% reduction in prime and choice grades (less fat). Ear implants may also decrease marbling negatively, but some studies show no effect. There is also marbling differences between sexes. In general, heifers have more marbling than steers. Timing of castration of bull calves can also impact marbling. Male calves left intact for a longer period of time will have more lean growth. Castrated males deposit fat sooner thus increasing marbling. Intact male calves have a more aggressive disposition which has been shown to reduce marbling. Residual feed intake (RFI) is a measure of feed efficiency and is defined as the difference between an animal’s actual feed intake and its expected feed intake based on its size and growth. It is independent of the level of production and the lower the value the more efficient the animal is. In a study with ninety two yearling Wagyu bulls their RFI was tested and classified into 3 groups: efficient (RFI@ruan > 0.5 standard diviation (SD) below the mean), marginal (RFI +- 0.5 SD of the mean) and inefficient (RFI > 0.5 SD above the mean). Inefficient bulls had greater dry matter intake than efficient bulls. Observations from the study suggested that Wagyu sires that are superior for both feed efficiency and marbling can be identified with assistance from RFI analysis. Studies have been done quantifying the advantages in fat production when feeding cattle a high percentage hay diet over a long period of time. The human body can manufacture most of the fat types it needs, except for essential fatty acids (EFA’s). Most positive health benefits are seen in two types of EFAs – linoleic acid (omega 6) and linolenic acid (omega 3). Wagyu beef is an excellent source of both of these EFAs. To meet a growing demand for higher marbled quality beef, Wagyu breeders have a golden opportunity to help meet this demand.